There must be something about turning 60 that sends a gym rat like Sun Valley’s Jim Carkonen into frenzy of memories and reflections. As Carkonen prepares for what he calls “likely my last season in the local Men’s League,” he sat down and asked himself a bunch of basketball questions recently and submitted them to the Idaho Mountain Express for consideration in publishing. For the last 13 years he’s been one of the best players in the local Men’s Basketball League—coming from the Seattle Men’s League where the 6-7, 225-pound forward was a Masters Division All-Star selection. Carkonen attended Federal Way High School near Seattle, Wash. where he played basketball in the school of over 3,000 students and was chosen as first-team All-Conference in the Puget Sound League in 1970. In 1971, Carkonen played on the Tacoma Community College men’s basketball team that won a Northwest Athletic Association of Community Colleges (NWAACC) national championship with a 32-2 record. It was the first of seven national NWAACC titles won by the two-year school. 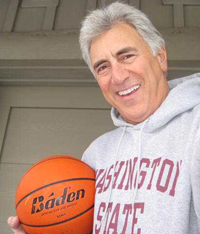 He led a Washington State University club team to a 17-0 championship season in 1974. Once, he scored 54 points in a Western Athletic Conference (WAC) tournament game. From 1976-80 he was the leading scorer at 28.0 ppg for the All-Star team in the Greek League—that’s right, in Greece. “It’s been a long wonderful journey,” he said. “To this day, I can’t remember to pick up the head of lettuce from Atkinsons’ but I can instantly recall with precision accuracy every statistical detail of an overtime tournament game in 1971. Community School boys’ basketball head coach Mike Payne has played for several years against Carkonen in the local Men’s Outlaw League. Payne said, “Jim is one of those guys who, because of his age, will deceive you with his skills at scoring points. You need to have someone good guarding him. “His outside shot makes you have to guard him on the perimeter. His inside presence make you put one of your bigger defenders on him. He doesn’t miss too many shots and has a great understanding of the game. Jim knows where to be and how to disrupt a play on defense. Gym shorts were a foot above the knee…..Huge Afros made players up to 7 inches taller…..Tattoos on players were non-existent…..Two-pound high-top canvas Converse sneakers were the only game in town…..Lifting weights for added strength was considered “taboo” for a basketball player’s shooting touch and development. · What was the culture like, playing ball in those early years? Fun, but stressful. It was a time of social turmoil. In my experience, playing college basketball in the 1960s and 70s was part sport and part combat. The racial tension of that entire civil rights era was intense and quite often spilled out onto the court. For many African-American athletes I played with, sports served as their primary outlet in their struggle for freedom from both poverty as well as racial oppression. It was an exciting, but angry and intense atmosphere. Game stoppages were commonplace, and they often escalated into explosive brawls and even gym riots. Whether it was game night or even team practice sessions, you never knew exactly what to expect. · Are the hoop players of today better? Yes—bigger, stronger, faster and more athletic at every level of play. They are not necessarily better shooters, passers or playmakers. 2012 marked the 25th anniversary of the 3-point shot. Prior to 1987 a deep shot launched from downtown was worth the same as a tip-in. It’s one of the best rule changes ever. It rewards good shooters and elevates the excitement. The implementation of the required “shot clock” was very positive for increasing game tempo to the delight of the fans. It forces the action and requires emphasis on offensive execution where it belongs. There are eight states that have adopted a shot clock at the high school level (the same 35-second clock as college) and I see a national progression of this trend. The days of sitting on leads are numbered. · Favorite part of the game? The brotherhood with your teammates, especially during that delirious post-game celebration of the upset nobody thought was possible. The kids playing the game—kids who may be limited with natural talent, yet they listen to instructions and give 100%. I’ve seen this from our local teams within Blaine County and Community School during my 13 years in the valley. · What was it like playing in an all Greek league? It was a rough-and-tough collection of former collegiate Greek/American ballplayers with names so long you needed an extra page in the program. It was a sports announcer’s nightmare. “At the line shooting a 1 and 1—Iakovos Papadoupolous Asimakopolous!” My given Greek name of Demetrios Constantine Carkonis was one of the shorter names. My initial exposure to Greek basketball began in high school when I took my very first airplane ride at age 17. It was an extraordinary trip to Greece with my mother and father to visit their family villages. A new outdoor basketball court had just been constructed near Olympic stadium in Athens. I eagerly joined in a pick-up game with a large group of locals. To my surprise, five minutes in to the game they stopped dribbling the ball and began kicking it across the floor. The new American sport of basketball had quickly turned soccer game. In recent years while saltwater fly-fishing in remote villages of Belize, Venezuela or Yucatan I smiled while watching large groups of kids shooting on rusty rims affixed to palm trees. The game has truly gone global. · Why play so many years? Lighting up the University of Washington frosh for 32 points in a 122-68 blowout. Memorable because it was the only game my father ever saw me play and it truly inspired me to another level. My mother never saw me play. She was born and raised in a small village in northern Greece and unfamiliar with athletics. She was very supportive, but afraid to watch any games simply for fear I would get injured. Having your parents and family in the bleachers is a blessing that players of any sport should never take for granted. · Your most fascinating hoop experience? Prison ball. I did it multiple times. These were not white-collar offenders, but it was basketball played within maximum-security federal and state penitentiaries. Inmates live for basketball, and their skill level is very high. Having both a high competitive desire and curiosity in my 20s, it was an experience I couldn’t pass up. You get strip-searched going in. You stay together with your teammates at all times. You enter the gym accompanied by armed guards, as you see inmates placing side bets on who will win the game. If you think your basic full court press is stressful, try having a death-row inmate guard you who is doing a life-sentence for a double homicide. That being said, there is a strange and effective sanction system at work in your favor. Aside from the guards, your primary safety net is the fact that inmates are bored playing against each other and relish playing teams from the “outside.” It’s a rare privilege they cherish. Any incidents of violence during a game and those privileges are revoked for several months. As in all sports, nothing is more sacred to a player than PT (playing time). So despite the potential for danger, the games were somewhat self-policing. · Advice for basketball junkies? Stay away from concrete surfaces. Shin splints are no fun. When you play multiple games on concrete you will never take wood floors for granted again. · Most misunderstood thing about basketball? Most people do not fully appreciate how difficult it is to officiate. It may look easy, but the game is fast-paced and the players are quicker than gossip at Starbucks. Everyone should officiate a basketball game at least once to appreciate the skill-set required to make the right calls on demand. · What has basketball taught you? Participation in sports prepares you for life. When you compete, you grow. You learn how to assess a situation and prepare a game plan for success. You learn how to develop self-discipline, work ethic, problem solving and a shared responsibility with fellow team members and coaches. You learn how to overcome adversity, leverage your resources and take on leadership roles and work within a unified system for the highest gain. The direct parallels between athletics and success within the business world are equally striking. · Anyone you wish to thank? Most of all I thank my two biggest fans, my wife Aimee and our daughter Sophia, for their never-ending patience and support in listening to endless stories of games-gone-by while rotating ice packs on all the injuries.